In this sequel to WHISPER OF THE HEART, a quiet suburban schoolgirl, Haru, is pitched into a fantastical feline world and must find her inner strength to make her way back home. Walking with her friend after a dreary day at school, Haru eyes a cat with a small gift box in its mouth attempting to cross a busy street. The cat fumbles the package in the middle of the road as a truck is rapidly bearing down. Haru manages to scoop the cat away to safety. To her amazement, the cat then gets up on its hind legs, brushes itself off, and thanks her very politely. Strange behavior indeed, but this is nothing compared to what happens later that evening when the King of Cats shows up in a feline motorcade replete with vassals, maidens, and even Secret Service cats. 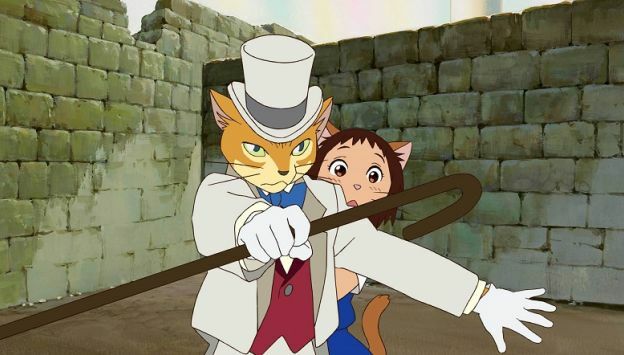 In a show of gratitude for saving his son’s life, the king cat showers Haru with gifts – including a large supply of individually wrapped live mice – and decrees that she shall marry the cat prince and come to live as a princess in the secret Kingdom of Cats.